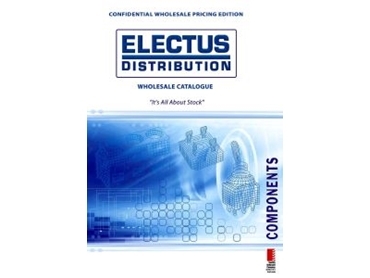 ELECTUS Distribution has released its latest wholesale components catalogue, containing over 5000 products. The catalogue covers a range of products including power and accessory items and general electronic components. Most ranges have been expanded, including surface mount components and EMI/RF/Line noise suppression components as well as wire and cable products. Detailed pricing and quantity discount information is included for all items. The catalogue has a new three way, easy find index. The Fast Find index at the front of the catalogue lets you locate product groups quickly. Individual products can be located using the product description or part number indexes at the back of the catalogue. The catalogue also includes a sheet of pre-printed, self-adhesive labels that can be used to create custom index tabs for frequently used sections. A CD-ROM version is being completed and features high quality images, extensive application notes and more than 3315 pages of semi-conductor data sheets. The CD-ROM has a search function, a printable order form and direct email ordering. The catalogue is available free of charge.